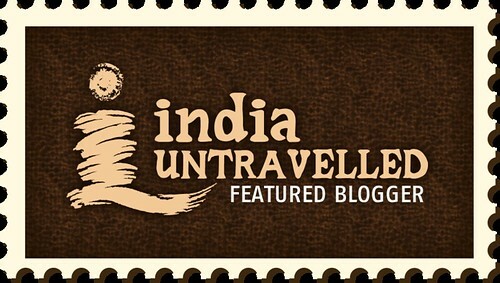 Road Less Travelled: Hunder- An Oasis In Middle Of Cold Himalayan Desert! 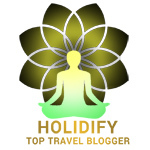 Hunder- An Oasis In Middle Of Cold Himalayan Desert! If there is Heaven on Earth, we surely were lucky to have visited it. 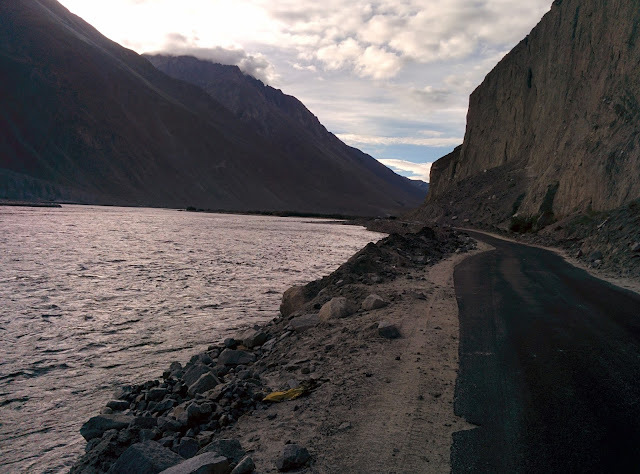 Nubra Valley welcomed us with some beautiful landscapes, the deep horizon with different shades of blue, massive brown mountains, vast uninhabited land with lush green patches, amazing roads and the only company that we had was Shyok river guiding us right into Heaven! 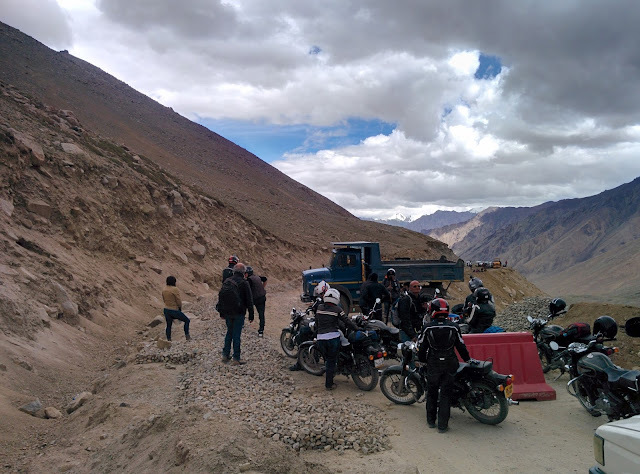 The ride to Heaven was via the much celebrated Khardung La Pass. The roads are challenging to say the least and landslides being a norm, road maintenance work is a regular occurrence and that leads to traffic jam. Considering the tough terrain and the obstacles that come up, patience is the key. On our way, we were stuck in a massive traffic jam as an Army truck had a flat tire. It was sad to see that a few people were not willing to wait despite being aware that the best effort was put in to ensure that the traffic is cleared but a few tourist vehicles and bikes were just in a rush. With the focus clearly on the destination, sadly these folks failed to enjoy the journey. After submitting the form at North Pullu check post, we proceeded towards Diskit and Hunder and were treated with winding mountain roads that were an absolute delight. 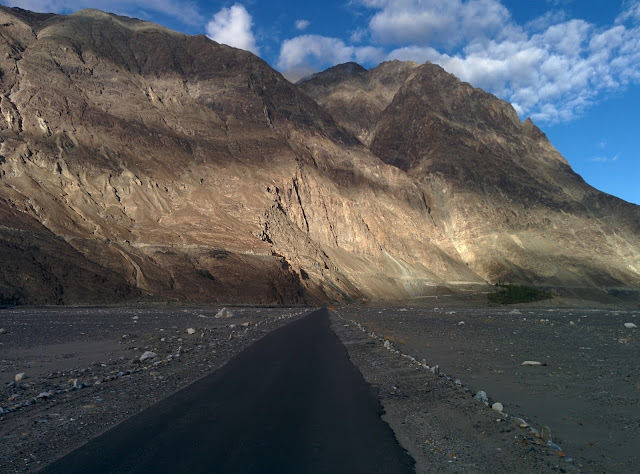 Though Diskit is only 120 km from Leh the roads are treacherous and steep but the valley is very beautiful. The tough and tiring ride was totally worth getting completely covered in dirt, mud and breathing in diesel fumes when we laid our eyes on the magical Hunder sand dunes from the highway. The little green oasis in middle of the desert was such a stunning sight and we were reminded of few movie scenes portraying Egypt. It was surprising to see these dunes completely surrounded by hills with a few of them being snowy peaks. Around the dunes was a village filled with greenery and agricultural fields as well plus spotting a river cutting through the dunes was an unimaginable sight. At first, you might assume it is a mirage but in this case the closer you get to the dunes you are proved wrong and you can see the beautiful river through the dunes and it is so crystal clear that you can count the stones on the river bed. Nature is indeed truly amazing. Sometimes these spectacular sights of Nature make us feel like it is fine if these places are not touched by humans so that they remain pristine. Being travelers this would be an irony as travellers crave for places that are natural wonders and are so amazingly beautiful. However, we are aware of the harsh reality that once humans reach the place it is just a matter of time before all the natural beauty is stripped off and replaced with concrete and trash. Some treasures should not be visible to the human eye for their own benefit. Apart from the striking natural beauty and the double humped ship of the desert, the most amazing aspect was unlike Jaisalmer sand dunes there were no hawkers selling snacks and beer. Thus saving the place from turning into one big trash can. However, gracious visitors have still managed to dirty the place. The double humped bactrian camels are the star attractions and one an take a camel safari.The high number of tourists reflected in hunder dunes for the camel safari. There is a good waiting period for the safari. A 15 min to 1 hour safari is charged Rs.200-600 respectively. The entry charges for sand dunes is Rs.20 for bikes. We took a nice calm walk in the sand dunes skipping the camel safari. It was one of the best travel experiences to see the sun disappear behind the hills and have stunning views of the Diskit Gompa with company of massive Maitreya statue. We were very surprised to see plenty of tourist vehicles on this stretch. The sheer high number of tempo travellers, taxis and bikes took us by surprise. It is high time that authorities come up with a logical system and maybe put a cap on the number of vehicles that ply on this route. The massive amount of pollution and carbon footprint left behind could have devastating effects on the fragile Eco system. There were times when we were directly exposed to massive amount of diesel fumes of commercial trucks. Our already very dirty riding trousers turned charcoal black and our eyes started burning to the point that it started watering and we even found it very difficult to breathe. The view of the massive Diskit Gompa is stunning from every angle we looked. Hunder is just 7 km from Diskit and is a perfect place to watch sunset. Massive Diskit monastery which takes center stage would easily be one of the biggest monasteries in the whole of Ladakh. The steep road leading up to the monastery made us wonder how they managed to built such a monument while it was accessible only by trek in the 14th Century. The view of Nubra valley from the monastery is breathtaking to say the least. Most parts of the monastery are off bound for tourists while the ones that are open are absolutely stunning. The Kali mata Mandir has a series of amazingly well carved sculptures, now restored centuries old paintings and thankas. Adjacent to the Monastery is the massive Maitreya statue, recently constructed and is over looking the valley. Entry fee to the Monastery is Rs.30 per person. We preferred to stay in Diskit which offers good number of stay options but there are not many good dine in options in both places. Throughout the trip, we have been extremely lucky with good food or great food but for one lunch in Diskit. The second day too our guesthouse was not serving lunch and two hungry souls walked in search of food. After a few hotels turning us down, we walked into hotel 'Olthang.' It was such a good news for us when the receptionist said they would serve lunch. Our order was very simple rice, dal tadka and masala omelette. The tadka was simply amazing with good flavor and plenty of coriander seeds and a healthy load of oil. The food tasted heavenly and we wiped our plates clean. A heavy lunch for two costed us Rs.270. Their service was also excellent. During our stay in Diskit, we checked into 'Kharyok Guest house' which is on the main road. The rooms were pried at Rs.900 and were brilliant. The room had amazing soft mattress and pillows with super soft and thick quilt. The guest house has an amazing green garden and homemade badminton court. Running hot water is provided from 6-11 am and the buffet dinner served here was fresh food right from the farm and was lip smacking. Dinner was priced at Rs.150 per person and had a very good spread of dal, rice, super soft rotis, mixed vegetable, salad and papad. During our two nights stay here, there was power cut for several hours but we absolutely had no issue with that as we spent long hours in the sit out that offered amazing views of Himalayas. The rooms have TV and they also offer Wifi. Their dining room is very pretty and cozy. Given the remoteness of the place it is absolutely justified if they have power cuts. They even have solar water heater and in case you need hot water in the evening they provide it in buckets. In the remote regions of Ladakh, we experienced how awesome and powerful the impact of clean natural energy source could be. Right next to our guest house was a massive stream with clean water. The thundering sound of the flowing stream was so soothing to our ears. 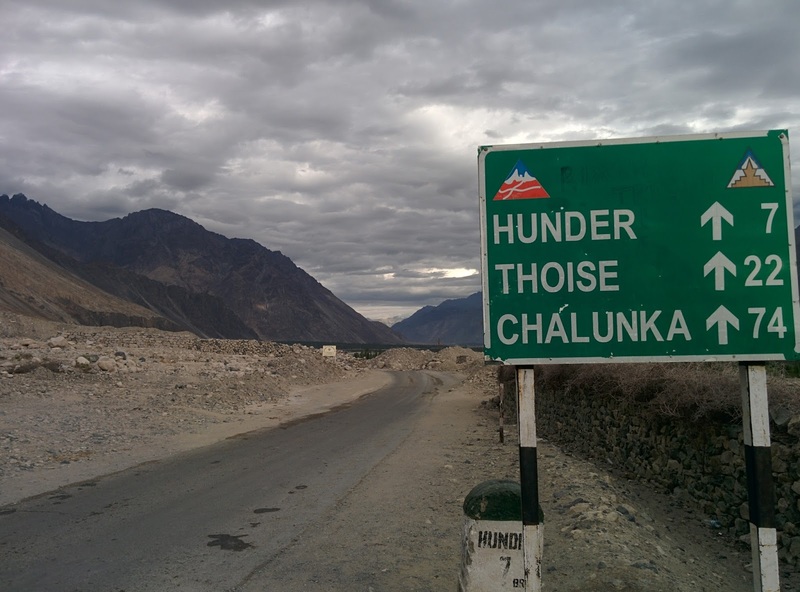 The climate here in Ladakh is highly unpredictable. Though it falls in the rain shadow area while we were on a lengthy road trip (June to July) here it did rain and drizzle a few times. One minute the skies were clear and deep blue and just like that the condition became over cast and gloomy. It drizzled for a few minutes and then there was sun shine and that is why we always had our rain gear handy. During our second day in Dishkit, there was thundering, heavy showers and the bikers coming from Leh had a tough time riding to Dishkit and were stuck in crazy traffic jam. Our adventurous ride back from Diskit to Leh via Kardung La commenced early in the morning. D-ue to the previous day's rain there were landslides in a few spots, luckily nothing serious that could have halted our as well as other travelers journey. There were several patches where the stream runs by the road that were over flowing on the highway. Being an early bird has it's own perks as for the first 25 km from Diskit to Khalsar we did not see a single vehicle on either side of the road. And in no time we reached the green Khardung la village and it was such a pleasant ride. Just a few kilometers from here we reached the North Pullu check post took a good break, geared up to encounter steep slopes, extreme cold weather and the unforgiving nalas or water crossing on the highway. The entire stretch of 30 km between north and south pullu are such a delightful adventure or a nightmare experience depending on who you ask. In our opinion it was such an adventure. During our ride we crossed 24 nalas of which 7 were massive. En route we stopped at K top clicked a few pics and reached Leh in 4 hours. Do stock up enough fuel for the to and fro journey. The only fuel pump in Diskit is in absolute shambles and unreliable as it is the only petrol pump for the locality in Diskit. It was in such an interesting sight- the machines were old, rusted and stripped naked and the pumps are hand cranked. Very true Yogi, Himalayas is truly a Paradise.